This year, the 6BG reunion will be Everett, Washington. Information about the Reunion and a sign up sheet will be included in the June 2019 newsletter. This reunion had several highlights, including a tour of the Mountain Home Air Force Base and the Warhawk Air Museum. We were joined by Lt. Col. John Barry and the "Rowdy Rebels from the Air Force Academy. This reunion had several highlights, including a tour of Galveston, the Lone Star Air Museum and a presentation to the local ROTC class. There is a video of the vets sharing their recollections on YouTube. This event was again hosted by the Ritter family. There is a video of the vets sharing their recollections on YouTube. Details were posted in the June 2013 newsletter. This event was hosted by the Ritter family and was the first time the Group had visited Milwaukee. See the June 2012 newsletter for details. David Wilson has made pictures of this available on Flickr. There is a video of the vets sharing their recollections on YouTube. This is one I missed. Took tours of the White Sands Missile Range, the Trinity bomb test site and the Farm and Ranch Museum along with several memorable meals, including lunch at the Owl Club and dinner at the Double Eagle Restaurant. The Group was also honored by the citizens of San Antonio and of Las Cruces, who dedicated a monument honoring the 6BG. 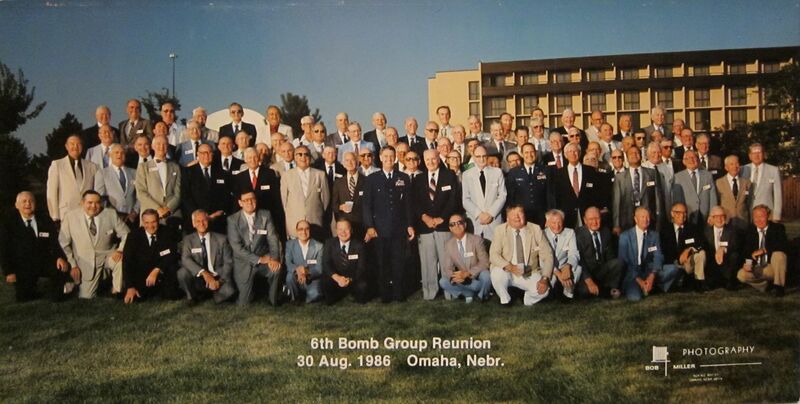 John Creek, Jr. and his family (now residents of New Mexico) again hosted this event and handled the arrangements for the events, including making many visits to AF security to obtain the necessary clearances for the trip to the Trinity bomb test site. Took a tour of "Fifi", the Petroleum Museum and enjoyed the hospitality of the people of Midland, including a Texas barbeque. The event was hosted by John Creek, Jr., a resident of Midland, who also handled arrangements for the events. Visited the Smithsonian and the "Enola Gay". The group unsuccessfully tried to take a tour of "Doc", but had a nice tour of the new Wichita Air Museum. I believe this is the first reunion. Just a bunch of kids, most in their 60s.